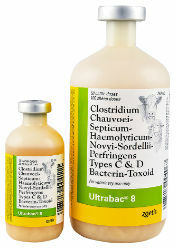 For use in healthy cattle and sheep as an aid in preventing blackleg caused by Clostridium Chauvoei, Septicum, Haemolytrium, Novyl, Sordellii, Perfringen Types C & D Bacterin Toxoid. Provides comprehensive clostridial protection in one vaccine. Inject 5 mL for cattle and 2.5 mL for sheep SQ. Revaccinate 4-6 weeks later and then annually. 21 day slaughter withdrawal. Vaccine is SAFE for pregnant cows and calves nursing pregnant cows. Subcutaneous (SC) dose is 5 mL followed by a second dose given four to six weeks later. For CI. haemolyticum, repeat the dose every 6 months in animals subject to re-exposure.